The Holy Grail for the internal communications has always been the one-button-reaches-all method of sharing information. For the majority, especially those employing ‘offline’ workers - manufacturing, retail, engineering to name a few – this remains an undiscovered luxury. But times are changing and, suddenly, the rise of the smartphone coupled with the surge in social media activity means there is a common platform. Just not one you might consider as part of your internal communications arsenal. The missing link is the employee advocacy program. A strategy and platform to collate and strengthen communication and interaction will harness the social media activity that occupies employees’ leisure time. Status updates have given way to sharing stories. Newsfeeds are full of amusing videos or memes. It’s a trend that has even led Facebook to introduce a new ‘Lists’ feature to try to redress the balance. For brands though, this is the opportunity to get in on the act by capitalising on free publicity. For the internal communicator, it’s a chance to reach a potentially disconnected workforce. Offline workers with no company laptops rely on notice boards or face-to-face communications in the workplace. With a smart employee advocacy program, these slightly clunky and inconsistent methods can ride on the coat tails of the fast-paced, high profile social media channels. By sharing brand stories, reviews and experiences, companies can get their once-disconnected staff to feel more at one with the brand. It’s always been tricky for internal comms to truly get to grips with the cascade of messaging. Does the message reach the people undiluted? Is there enough detail to ensure understanding and engagement? With an employee advocacy app, it’s possible to get right to the bottom of what interests your employees. According to Google, a massive 80% of the global workforce (approx 3bn) performs work that doesn’t require a desk on a daily basis. That’s 80% of people that you can’t guarantee regularly seeing emails. With an employee advocacy app, you can start to tap in to what people are reading and see what content gets the best interaction. An app’s sharing mode can also be switched off, enabling AB testing of content. An advocacy app will give you the opportunity to identify more interactive team members. Those individuals who interact regularly could be given focused training to turn them into external social champions, advocating the brand and sharing the messages. This phased approach to building an advocacy program will allow you to scale up your external social ambassadors at a controlled pace - ideal for heavily regulated industries. Many large businesses struggle to implement a strong brand if they operate across multiple sites. Employees tend to be loyal to their immediate team or location but can often forget the bigger brand-level loyalties. An employee advocacy app facilitates conversations between locations and teams. Internal collaboration might be as simple as sharing the view from the office or stories from the coffee machine – whatever works to encourage interaction. Once new behaviours are adopted, brand content and messaging can be included and shared too. Apps can be used to run regular, short surveys to gauge opinion and feeling and also to test whether messaging is understood. This far more agile approach is of much greater value to internal comms teams, who traditionally might only get an annual insight into mood and motivation. The biggest hurdle for internal comms teams has always been getting the message out in a way that can be understood, and related to, by all employees. Employee advocacy is the key to unlocking the blockage that often exists between senior or middle management and the people on the ‘shop floor’. 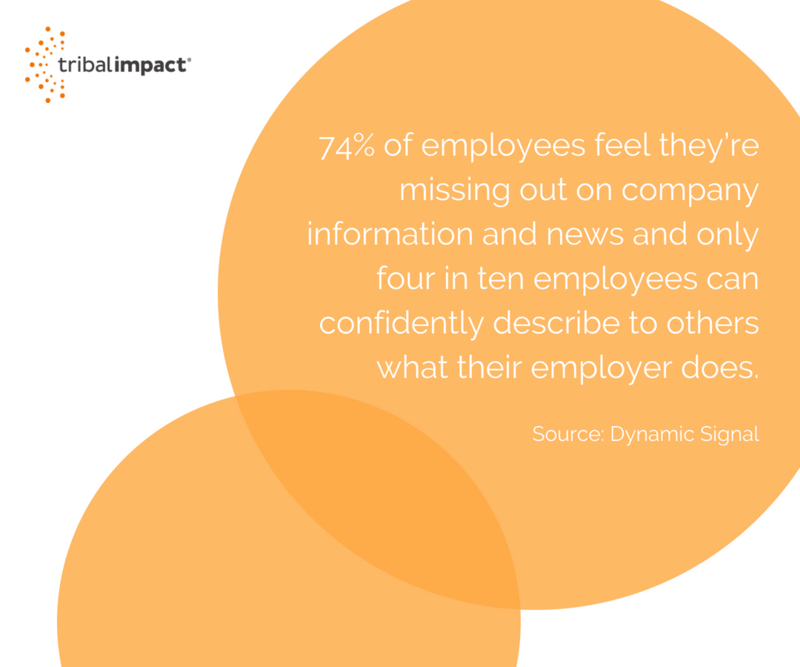 According to Mindshare NA & Dynamic Signal, 74% of employees feel they’re missing out on company information and news and only four in ten employees can confidently describe to others what their employer does. 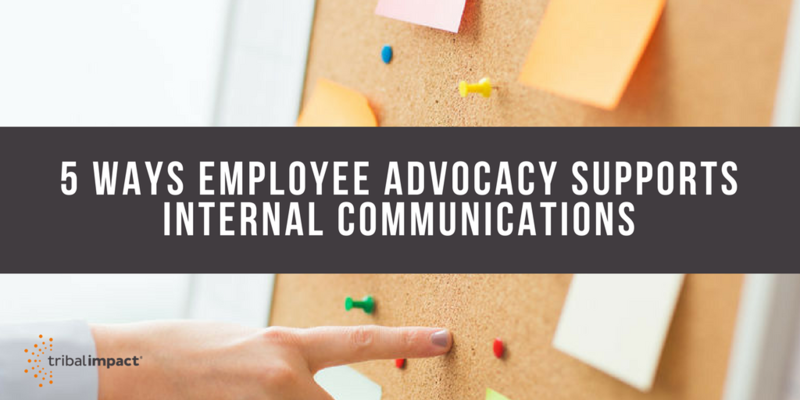 Creating varied and engaging content and encouraging interaction through employee advocacy is a far more agile approach than publishing newsletters and trying to attract attention to them via the intranet or noticeboards. An impressive 39% of employees admit to posting content about their employer on social media without any encouragement from their employer (Source: Weber Shandwick) which hints at the sort of success that could be achieved by an advocacy program which streamlines communication programs and incorporates the incredible, influential power of mobile devices.